High Block State is a modern and colorful place of the 21st century where all the attributes of a large metropolis are gathered. Opening the map you will find 3 small parts of the state connected together due to the roads; look for road pointers to get from one part to another. The architecture of this city is based on cities from the real world: skyscrapers neighbor with small institutions, cafes and restaurants, and in the back you will see residential buildings. High Block State is constantly expanding and becoming more and more. This is clearly visible on construction sites and cranes, be sure to visit these places before updating the map. To easily navigate through the cities there is an extensive network of roads linking the main places. 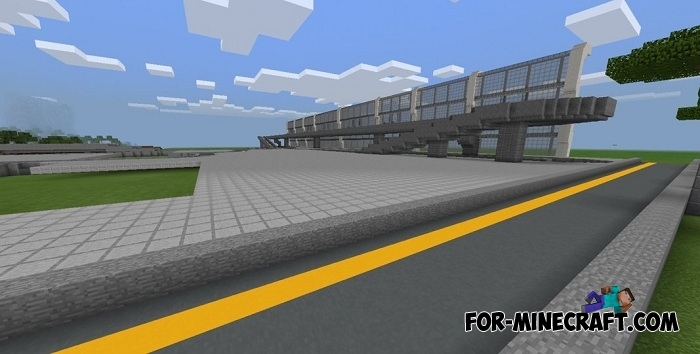 Buy (install) one of the super cars for Minecraft Bedrock Edition for fast driving on smooth roads. It can be a McLaren or Lambo or any other car that is on our site. Use the search to find something among 20+ different cars and other vehicles.